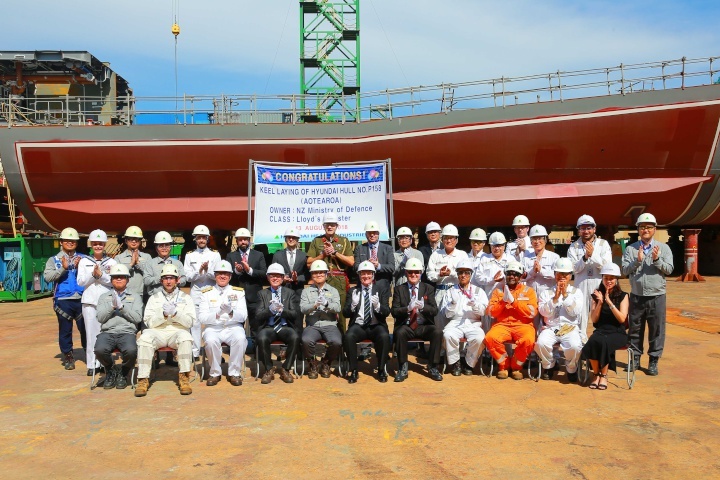 The keel-laying ceremony for the future HMNZS Aotearoa has been held at the Hyundai Heavy Industries shipyard in Ulsan, South Korea. Two pieces of Aotearoa’s keel are joined at the symbolic keel-laying ceremony in Ulsan, South Korea, yesterday. The keel laying, marking the official “birth day” of the ship, is an important ceremonial occasion, which has traditionally represented the laying of the initial piece of timber that would make up the ship’s backbone. 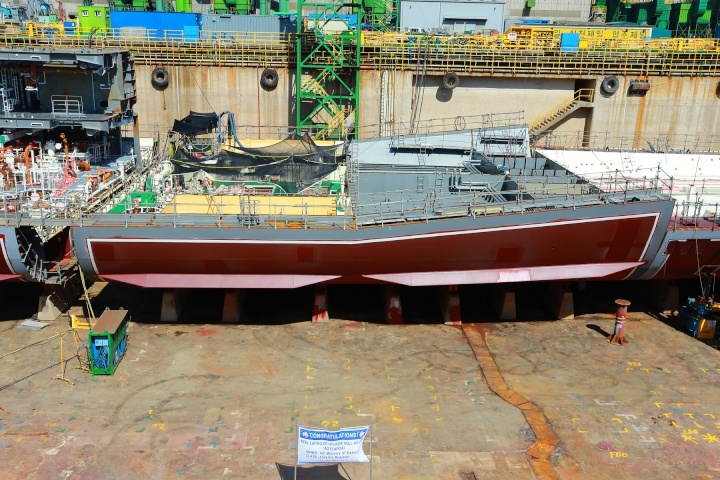 Aotearoa’s keel laying consisted of more than 500 tonnes of carefully constructed keel blocks being positioned together in the dry dock, where she will continue to expand upwards and outwards until her launch date early next year. This is a significant day for the Royal New Zealand Navy (RNZN), because it represents a tangible milestone in the journey to having a multi-purpose vessel that provides refuelling services, freshwater generation, significant cargo-carrying capability and the ability to conduct air patrols with an embarked Seasprite or NH90 helicopter. Aotearoa represents the first of a new fleet of RNZN ships built specifically to address the global requirements of the New Zealand Defence Force and partner government agencies, for deployment from Antarctica to the Arabian Gulf. While she is constructed over the next 12 months her ship’s company will also be assembled, trained and prepared to operate the largest vessel the RNZN has ever had – more than three times bigger than Endeavour, the vessel she replaces. “This is an exciting time for our Navy,” said Chief of Navy Rear Admiral John Martin. HMNZS Aotearoa is designed to provide logistical support to New Zealand and coalition maritime, land and air units. Her primary purpose is to conduct fuel resupply but she will also be capable of supplying dry goods, water, spare parts or ammunition. Her missions will include humanitarian and disaster relief, support to United Nations security operations, support to a coalition naval task group and Antarctic resupply. New Zealand Ambassador to South Korea Phillip Turner (bottom row, fourth from left) joins representatives of the Royal New Zealand Navy, New Zealand Defence Force, Ministry of Defence, the Hyundai shipyard and Lloyds of London in celebrating the keel laying of the future HMNZS Aotearoa. She will have an ice-strengthened hull, the ability to carry 12 20-foot shipping containers, high-capacity freshwater generation plants, self-defence systems, aviation and marine fuel cargo tanks, dual all-electric replenishment-at-sea rigs and will be able to carry a Seaspite or NH90 helicopter. The recently released Strategic Defence Policy Statement 2018 also highlighted the importance of the New Zealand Defence Force’s role in supporting New Zealand civilian presence in the Ross Dependency of Antarctica, and the work Defence does in working with other agencies to monitor and respond to activity in the Southern Ocean. HMNZS Aotearoa will play a significant role delivering fuel and other goods to support Scott Base and McMurdo Station during summer months once an icebreaker has cleared a path.